A Facebook inspired recipe does it again! There are kazillions of recipes being posted from wall to wall on Facebook. I drool over them just like you do. But, just like you, I can’t cook or bake or EAT everything out there. 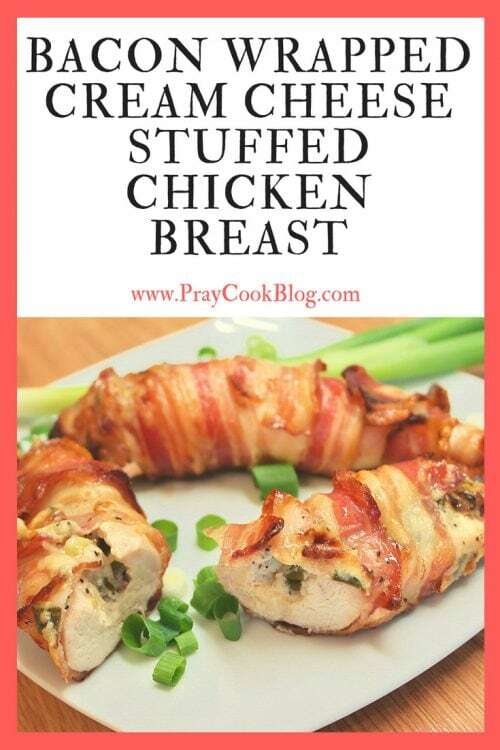 Today, we’re going to be cooking Bacon Wrapped Cream Cheese Stuffed Chicken Breast! This is a MUST TRY recipe for any bacon lover. Occasionally I stop, read a recipe and then print it out. I am not certain if all the stars aligned or what, but this recipe either looks exceptionally appealing or I’m just hungry at that moment. Maybe a little bit of all three. 1 lb chicken cut into four 4 ounce pieces. One pound of chicken breast is either one large breast with a thin film-holding each half together or an already cut breast that yields two halves. When each half is cut in half you will have four 4 ounce pieces, which is a very nice serving size when wrapped in bacon. We, the Chief, my sous-chef dish-washing mom and I, LOVE stuffed chicken breast. Enuf said. This recipe – What a surprise!! My new favorite stuffed chicken breast. If the cream cheese and pepper jack don’t do it for you, the bacon will put this over the top! The chicken stays very moist as it cooks and the pepper jack cheese will melt and the cream cheese will keep a little form. (If you can’t buy pepper jack where you live, any favorite meltable cheese works.) The bacon – well it crisps up beautifully. I turned these over and broiled the bottoms to crisp the bacon a little more. I will be wrapping these bacon wrapped cream cheese stuffed chicken breasts up for a Christmas party or two for sure, and recommend you do the same at your next event. If you are a “chicken-eater” like I am, don’t stop with just this recipe – check out how to reheat chicken or reheat wings by Emily at Cooking Chew! p.s. I have found that some “big appetites” like a second helping of this main dish. 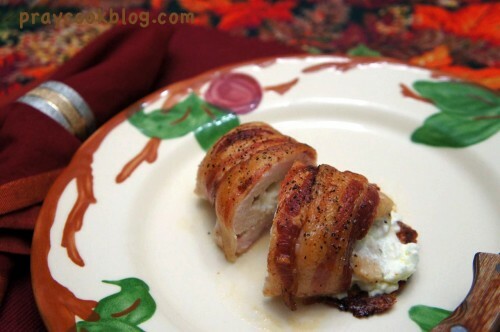 Be prepared and make plenty of bacon wrapped cream cheese stuffed chicken breasts to go around! An easy, but elegant main dish! 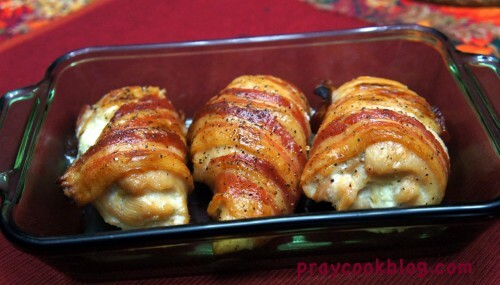 The chicken is moist, the flavor superb and the bacon a perfect wrapping! 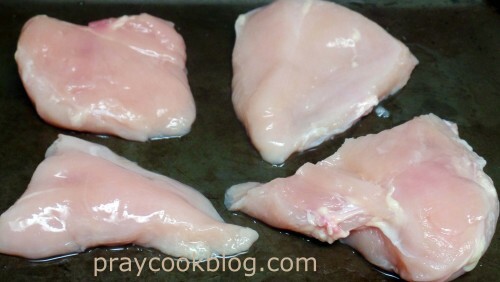 Cut chicken into 4 equal size pieces. Pound breast so it is about 1/4" thick. Mix together softened cream cheese, chopped green onion, and pepper jack cheese. Put 1/4 of this mixture into the middle of each piece of chicken. Wrap 1 to 2 slices of bacon around the chicken breast, secure with a toothpick, if needed. Place on baking sheet (with an edge on it) or a baking dish and bake for 30 minutes at 375 degrees F.
* One piece of bacon wrapped around each breast is enough. But 2 pieces of bacon for each breast fully wraps the chicken and is outstanding as well. * 1 lb. of chicken usually equals one large chicken breast cut in half. Cut each half in half again and you will have four 4 ounce pieces. * This recipe is very adaptable to being basted with your favorite grilling sauce, marinade, chili sauce, or sweet and sour sauce during baking. Yes, this is entirely possible. Personally, I always cover my raw ingredients in the refrigerator if holding them for a few hours. What is the definition of a few hours? 12 to 24 ? I usually only hold raw prepped ingredients for around 3 hours in the fridge (covered) as a personal preference. However, I rarely hold raw ingredients as I prep and bake immediately in most cases. Oh, this all sounds wonderful. Thanks for sharing! I have a problem. I made 8 of these expecting company but they had to cancel last min. Unfortunately the chicken was already in the oven , there is no way I can eat all of them before they go bad can i freeze them even though they are fully cooked? I just made this recipe for the 10th time or so and ended up needing a substitute for the pepper jack. I used gouda, and I think the buttery taste made it even better! Hi Gordon, thanks for the info on using Gouda. I am going to try that next time! Is it supposed to be a high or low broil setting for those last 8 minutes? High Broil. I also watch like to watch it at the end to get that perfect bacon crisp. Sometimes it isn’t the full eight minutes depending on bacon thickness and where my rack is set. Yes, mozzarella would work great because it won’t all leak out. Thanks for sharing! Sweet chili sauce really does take this recipe over the top! Thanks for sharing and I am so glad you liked it even though you aren’t a huge fan of chicken. Win! My husband doesn’t like chicken at all. I’ve found that most chicken recipes also work good with boneless pork chops. I do that substitution all the time. Julie, if you make this with a thinly cut pork chop, please send us a picture and let us know how you like it! Just one word for you. It’s wonderful. I can’t wait to try this. I don’t think BF would care for the cream cheese filling, & neither of us are pepperjack fans, so I will make it w/ shredded cheddar cheese & maybe add some chives. Thanks for sharing! I have used other cheeses and it is awesome! I have also stuffed with spinach and cheese! Yum! I hope you love it! The recipe was good but very problematic. Pounding out the chicken was less than easy. It kept getting stringy and breaking apart even with light pounding. In the baking process, the filling all melts out and ends up all over the pan. I’m sure a top notch cook wouldn’t have the problems I had with it. Hi Robert, thanks for your comments. I have found not all chicken breasts are created equal. I have had some chicken fall apart on me in the past also. I have learned to make sure I get a full breast piece to start with (cut in half) without thinner meat around the sides. As for the melting “out” of the cheese – you are right, and securing the ends with a toothpick helps! When I wrote the first blog post with this recipe I didn’t include all the tips and tricks, but have added them as others make the recipe. I hope you will try it again. The flavors are stellar. Thanks for taking time to comment. What a delicious meal!! I served these tonight with steamed green beans and we were so happy with the meal 🙂 We aren’t pepper jack fans so I substituted Swiss cheese and wow… absolutely delicious and a hit with all of us! I’ll definitely be making this again and trying some other things with it. But the recipe as is turned out perfectly cooked chicken, nicely crisped bacon and a delicious filling. Thank you for sharing! Thank you for your comment. I am so glad you liked this recipe, it is an all-time favorite of My Daily Bread followers! Blessings! Thank you so much for this great recipe!! Did you make the stuffed chicken? How did you like it? Yummy. 1 breast left, next day fixed by heating sliced breast in small amount of sweet spicy sauce and added to spinach salad. Excellent as a leftover heated up! How we make it might be a little rich for a salad, but we do love ranch of lettuce! Just fabulous!! I was fortunate enough to get thin sliced chicken breasts which saved on time. Had six pieces that worked perfectly!! Awesome Vicki! So glad you enjoyed the recipe. I tried this but should change instructions above from “baking sheet” to baking dish. Baking dish definitely needs edges to hold in the liquids. I also baked longer than 30 minutes. I baked 45 and the broiled for 5, flipped roll and broiled the other side for 5 minutes. Instead of pepper cheese I used butter and cream cheese. Very good! You can also make ahead, refrigerate, and fix later. Thank you Ruth! You are absolutely right. My baking sheet has a 1/2″ lip on it but if yours doesn’t that could be a problem. I’ll make the clarification! Thank you! This chicken will make a great Thanksgiving meal because it is “special” but still easy to make! Wonderful made ahead of time and then cooked later. Also can be frozen and cooked after a brief thaw. In my experience cream cheese cannot be frozen. Hi Cheryl, I’ve had good luck freezing these. Although it’s completely possible to freeze cream cheese, it does alter the texture. Thawed cream cheese is less creamy and a lot more crumbly than fresh cream cheese. Because of this, it’s best to use frozen cream cheese in casseroles, baked dishes and dips and pick a cream cheese that has a higher fat content. It works in this recipe! On baking sheet and back for 30 Minutes? What does the ‘on back’ mean? Must be a typo … to bake for 30 minutes. Thank you! Isn’t funny how you can look at bake and back and just not see the typo! Thank you! Amanda, I am so sorry this is delayed in my response. A broiler is fitted into most ovens either at the top of the oven or sometimes in a gas stove/oven underneath the actual oven. A broiler coil turns very hot very fast and will brown or cook food quickly. I hope this helps! There is a broil setting on your oven. Read your time correctly or keep an eye on it because it is your highest heat setting in your oven. Great recipe…just had it again…2nd time in 2 weeks! Husband doesn’t really like chicken, but added some roasted fake jalapeño peppers and they really made the recipe pop! I don’t know what this is in reference to exactly, but probably a dried hot and spicy version of a jalapeno. These are cooking right now and my house smells heavenly! I wish I had read the comments before I began making this. Then on the other hand, I’m thinking that I will make this over and over again! So, to change, adjust, or alter this will have to wait until the next time I make it. Marvelous ideas and suggestions! I can’t wait to taste this and I can’t wait to try the suggestions in the comments section. The boneless pork chop idea sounds great! Tina, how did they turn out? Here are some suggestions for an already delicious meal…I add a slice of ham to wrap the cheese mixture, but I seal it to prevent the cheese from leaking out while cooking. I also wrap the bacon (2 pieces) perpendicular to one another, which also secures the cheese. If you have to use toothpicks, do not push through to the center, or you risk the cheese leaking out. I hope you enjoy! Thank you Katie! Just this summer I tried wrapping the bacon perpendicular to one another and it worked great! I just hadn’t gotten the recipe updated! Thank you very much! Your additions sound wonderful. This has quickly become a favorite in this household! We call em armadillo eggs! I just seriously have to use the thick cut bacon to make sure the cheese stays in the middle. It’s so sad when it doesn’t! Easily the best dish I’ve ever made. Amanda, recently I helped my son, Chris, and his family make 40 servings for our family reunion. Chris was in charge of wrapping the bacon. He wrapped one piece end to end and the other piece around the middle. It totally helped secure “in” the cheese! oh my, never dreamed of this on the grill, it would be the “bomb”!!! When I’ve tried this in the past, the cream cheese always melts out all over the pan. Am I doing something wrong? Hi Stacy, No I don’t think you are doing anything wrong. I have a little cheese come out as well and it cooks and crisps up around the chicken. It is so good that we leave it and eat it! But – I also try to tuck the ends closed as much as possible and even toothpick if need be. Also, “fat free cream cheese” does not work at all – it just turns to liquid. I hope this helps! Add a strip of roasted mild jalapeno in the center, and you’d have a great Popper chicken breast. Ingenious! Of course, this sounds wonderful! Thank you! Chicken Breast Poppers! I love this recipe. Thanx for sharing this with us. Hi, I’m making this right now. It’s the first time I’ve stuffed chicken. Do you have any kind of overview of stuffed chicken? What I mean is, a big list of things that can be mixed to make the stuffing, a list of things to cover the stuffed chicken, and things to drizzle over it, list of Condiments or garnishes to serve alongside? Hi Misty, no actually I don’t think I have ever put that all in one place. But it is a good idea. If you scroll through the comments from this recipe you will find lots of ideas that others have used. Thanks for stopping by and the good suggestion! 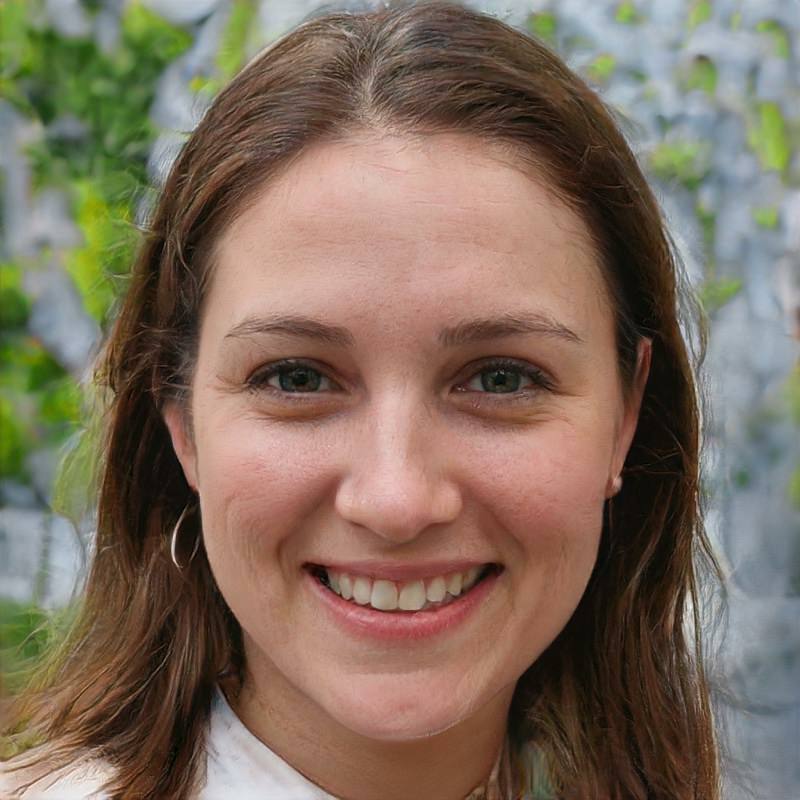 Thanks for your response Catherine 🙂 when I look online for a recipe, too many ingredients scare me off, but then I like to understand the “principles” of the dish and all the possible combinations. That way, I can take it from there. I followed this recipe exactly last night, and thought it was perfect as is. My boyfriend thought so too! Yup, I’m going through the comments for variations. I’ve had this before, very good, also very rich taste with the cream cheese. Good and easy recipe, though. Thank you, Doug. Thanks for spending time on my blog. Visit again! My husband could not stop ranting and raving about this recipe! It was quite the hit. I had some left over dried beef that needed used up, so I included that in the cream cheese, cheddar cheese, and green onion filling. What a delicious addition! I also whipped up some homemade BBQ sauce to glaze over the top of each piece when finished cooking. This made this meal a smashing hit! Wow, Jen! Thanks for sharing. Your changes/additions sound yummy! I think there are a zillion combinations! Happy Cooking! 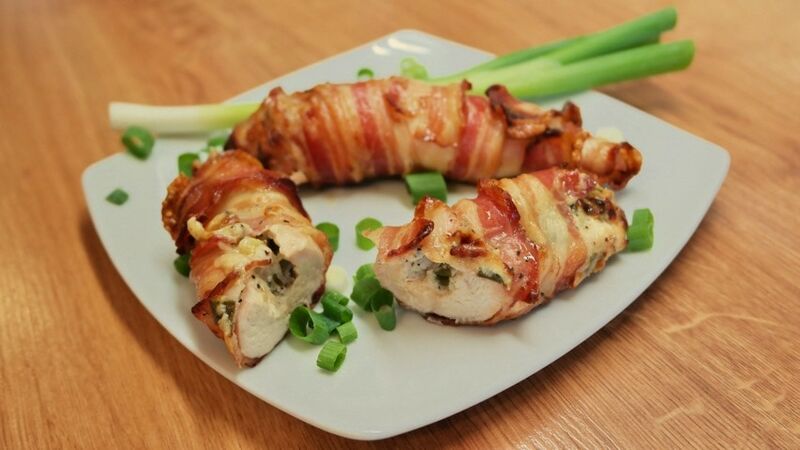 Bacon wrapped chicken breast with cream cheese, green onions & pepper jack recipe: It doesn’t say how much of each type of cheese to use, how long to cook it or at what temperature? help! Jo, at the bottom of the blog post, is the recipe, written in recipe form with all the details. I hope this helps! Could you wrap two more bacon strips the other way to help keep the stuff inside? yes, but cooking the bacon well will take more time. I would par-cook it a bit first, Just until it is translucent and then wrap and cook. I can’t wait to try this. I don’t think BF would care for the cream cheese filling, & neither of us are pepperjack fans, so I will make it w/ shredded cheddar cheese & maybe add some chives. Thanks for sharing! No worries, this is a very adaptable recipe … add what you like, leave out the rest! Made it for supper tonight. I stuffed it w/ a cheddar cheese blend & a little cut up chives. Next time I’ll put more cheese in, but that aside we have a winner! BF liked it, too, wants me to put broccoli in it next time. This will be awesome to serve company. Thanks again for a great recipe! Thanks for sharing your results Jeanne. I really like the idea of broccoli – I’m going to try that next. Such endless possibilities! You are welcome, hope you love it! I am trying this recipe tonight! But I wanted to ask you, can I freeze them (raw of course/not cooked)? Yes! You can freeze them. I am a fan of vacuum seal bags for freezer cooking, but you do not need to rely on them. I also use self sealing freezer bags. I prepare each spirally wrapped chicken piece, then nestle them, sides touching, in a freezer or vacuum seal bag that is placed on its side to maximize surface area. I usually freeze my meat on a baking sheet for an hour or two before putting them through the vacuum bag. It just keeps the juices from running out. Hope this helps and that you are enjoying a lovely meal tonight! Blessings. How d I u keep the cheese from melting out? Hi Stephanie, A little bit of it does melt out. 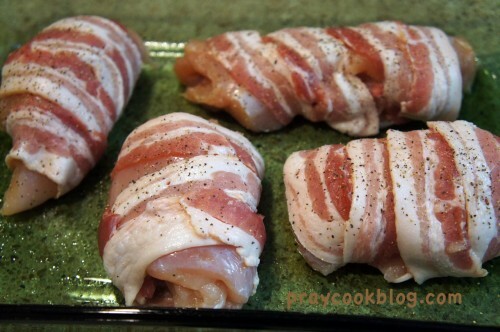 But when the bacon is wrapped to the end of the chicken it helps to keep most of it in. Also, what does run out creates a lovely little puddle of crispy cheese that I always include on the plate, because everyone fights over it! Hope this helps. My husband just ordered this for dinner. Thanks! Maureen, what a compliment that John would see something on my little blog that he wants you to make! I think you will love this recipe. Please let me know what you think! I make every Christmas. But instead cheese I mix chopped mushrooms with mashed garlic and butter. The taste is brilliant. Ah Laura, this sounds wonderful! I’ll give it a try too. Great dish, but you quote the bible etc, yet don’t give the original poster any credit which deserve, after all they created it. Hi Cae, you are so right! I always give credit to the originator of a recipe when I know it. In this case this recipe was posted on Facebook and SHARED around but it had no name of where it came from. I Googled the recipe to see if I could find the origin only to find dozens of recipes very similar posted from Food.com to Allrecipes.com. Thank you for your comment and rest assured I will always link back to originators when I can! This recipe was printed in a magazine (can’t remember which one!) about 20 years ago. I remember it well because I made it for my sister’s baby shower! It also called for a base of uncooked rice, can of chicken broth and the chicken placed on top. It was delicious then, still delicious now!! Oh that does sound yummy! Thanks for sharing. This is absolutely delicious as written, the second time I made it I added minced garlic to the stuffing mixture and it was also good! Thank you so much for sharing your recipe, my family loves it! Thank you for sharing Alissa! So glad your family likes this recipe, be sure and check out the Spinach and Feta stuffed chicken too! God Bless! Yes, of course and thank you for asking! Will you be able to provide a link to my website as well? Always have the ingredients in my fridge & feeder.needed more ways to make Chicken. Thank you so much. You are welcome Bridget. I find these are ingredients I usually have on hand also! Blessings to you and yours. 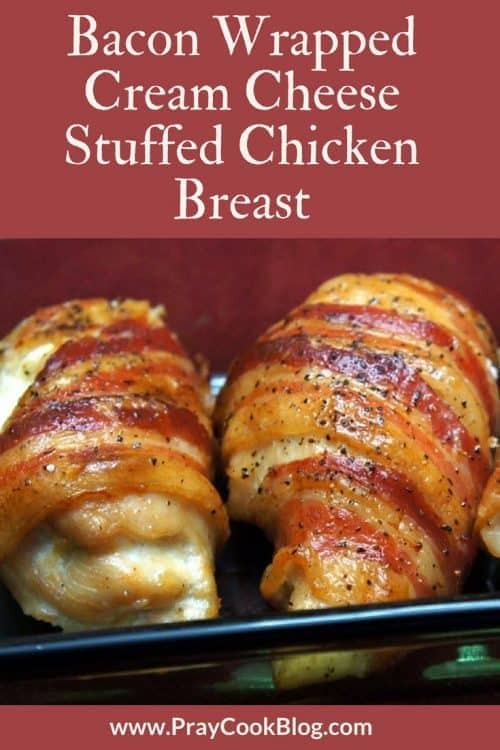 BACON WRAPPED CREAM CHEESE STUFFED CHICKEN BREAST…… it says cut up chicken into 4 equal sizes, is that 4 chicken breasts, or one breast cut in 4? I always get mine split….. so should I cut the half in 2? HELP!! Hi Betty, I’ll bet this is too late but hopefully not. When I buy chicken breasts they are usually the size of my hand or a large man’s hand. That is the one I cut in half. The size really depends on the size you want your rolled up chicken to end up. This ends up being about 3 to 4″ rolled up and is the right size for one serving. Let me know if you have other questions! Will add a can of shredded crab to cheese mixture. Oh Betty that sounds wonderful! Let me know how you like it! Yes Delores, you can use mozzarella or another kind of melting cheese. However … mozzarella doesn’t have a lot of flavor so the whole thing might be a little bland. If you use mozzarella then I recommend you baste the chicken breasts with chili sauce or some favorite sauce at the end while broiling the bacon. That will give you a flavor pop! I make a variation of this recipe with Mozzarella and Gruyere cheeses rather than the pepperjack as we love the creaminess. The Gruyere adds flavor that the Mozzarella lacks. I typically also add a bit of asparagus or spinach as well. Definitely a family favorite!! Jill, this sounds delicious. Recently we made 40 servings for our family reunion and we used pepperjack cheese sticks! They were terrific! Thank you for being a part of my blog! I wouldn’t eat them after you drooled over them! Is this a dish i can use as a pre prepped meal? Id like to make it and use it for lunches at work if possible. I believe you can make this ahead, bake it, wrap well and refrigerate during the week to warm up later. I have warmed up a leftover a few days later and it was great. I have never baked and frozen and then thawed so I don’t know about that. Marilyn, thank you for all these great options. I will share them when I update the recipe! Blessings. Very good recipe I added spinach artichoke and mushrooms to it and used provolone cheese turned out very nice will be making this again ..,maybe with more modifications. So glad you found this a good main dish and I like your modifications! So use a baking sheet not a glass dish like picture? Alex, a baking sheet or a baking dish work fine either way. I have used both. When I am making quite a few I use a large baking sheet and a smaller baking dish for just a couple. I moved the breasts from a baking sheet to this green glass dish for the picture. I hope that helps! Thanks they are in the oven now! Alex, how did they turn out? I made this and it was good. I excluded the onions because noone in my picky little family likes them. But good none the less. I will be cooking this again. One of the things I like about this recipe is how flexible it is and how you can make it to suit your family’s tastes. I just prepared this. Haven’t put it in the oven yet. I couldn’t get mine rolled all the way. They looked more like tacos. Lol. I’m sure it will taste ask the same tho. I myself added diced jalapeños also. Can’t wait to eat it. Denise, I am sure they were tasty too. Rolling up a chicken breast sometimes takes a little practice and the chicken needs to be pretty flat, but not too flat or it breaks through. Enjoy! I tried this recipe tonight and it was DELICIOUS. I did change some things after reading some of the comments. I used chives and added red pepper flakes. I also used sliced pepperjack instead of shredded because I had it in the fridge. I will definitely make this again. BTW, the bacon browned just fine after I put it under the broiler. Monica, thank you so much for your comments and the information. This is one of those recipes that you can really change up depending on what you have on hand. Have a blessed weekend! Vince, I have tried to do the math on this one and decided I best just go with “all things in moderation!” Thanks for stopping by! In some recipes low fat cream cheese gets very watery so I haven’t tried it in this one. Your approximation of 2500 calories might be just a bit outside reality….. Chicken breast is 130 calories, cream cheese 160, pepper jack cheese 110, bacon 45 per slice (180 for 4) and a negligible calorie count for green onion…. A bit shy of 2,500 calories. Steve, you are so right. When I got the recipe via Facebook there was no calorie count and I try to keep an “everything in moderation” lifestyle, which includes a bacon wrapped chicken breast from time to time! Thanks for taking the time to help us all with these numbers! As you say … “a bit shy of 2,500 calories”! Making these tonight. We are using montery jack and fresh jalapenos instead of the pepper jack cheese. 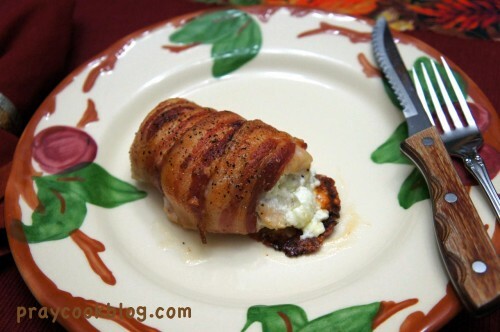 I came across this recipe while looking for a bacon wrapped cream cheese stuffed jalapeno recipe. Hence the addition of jalapenos. Lol. I may in the future try a goat cheese and chive stuffing too. These look awesome and I am really excited! Heather, how did your chicken turn out? Fresh jalapenos will definitely kick it up a notch! reading this recipe, I thought that some crushed red pepper/onion chrevre from the creamery I help my friend at would be tasty in this!! We love goat cheese and the chevre is much like cream cheese. Will be trying this on Sunday! Both of you suggestions sound wonderful. And the chevre will work wonderfully. My granddaughter is a goat cheese fanatic. So glad you mentioned it. Will also try! Goat cheese is so good and I haven’t tapped into it like I should. Enjoy! 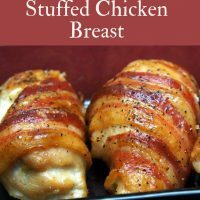 I found this recipe and it looks great but I’m short on cash and only have bonless skinless chicken thighs instead of breasts, will it still work well or should it be done with only breasts? No problem. I just don’t happen to like dark meat and so most of my recipes tend towards chicken breasts. Carefully debone the thigh and then pound lightly. 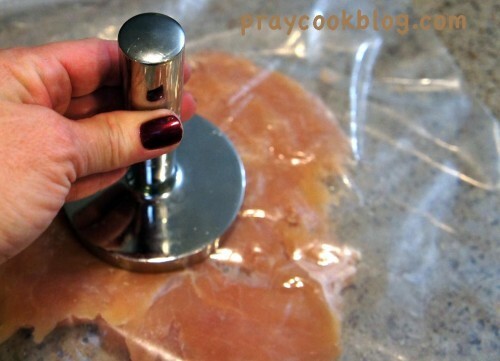 This will give you a very nice piece of chicken to stuff and wrap. Please let me know how you like it! I just made this tonight and all my cream cheese came out..
My husband said ummm, very, very good. He said you sure can make this again. I had 5 breasts, 8 oz. cream cheese, cut up some provolone cheese and half the amount of motzerella and did a yellow onion, and bacon. I did not have the other items I was suppose to use. He is over there moaning. lol. Thanks Timothy! It is delicious. My cream cheese mixture is coming out. It does not look anything like yours. I am hoping it will still taste good. 30 minutes and my bacon is not near brown. Debbie, not to worry, sometimes the cream cheese does cook out a bit depending on how the ends are put together. Just serve that lovely crisp cheese along with the chicken! Also, bacon will not brown totally until you broil at the end. Is there a good substitute for the green onion? Its the only thing I don’t have on hand. Wasn’t sure about chives maybe?? Yes April chives or shallots can be used for green onion, or even a yellow or white onion finely chopped. Hope this turned out well for you! To always have green onions on hand I use a small empty water bottle and fill it with dry sliced green onions and keep the bottle in the freezer. It shakes out easily and it’s always ready to use. Helene, this is a great idea! I will pass this on to readers. Thank you! You can use chives. We make this a lot. We put a few cans of cream of chicken soup in with it. The bacon does not crisp up as much as this one but it is still good. We always serve it with cooked rice and use the soup to put over the rice. Thank you Nancy for your variations. I love the creamy soup over rice as a side! fresh chives would be great!!! I’m wondering if there a typo in the recipe? After mixing the ingredients together you say put 1/4 of it on the chicken with no comment about left overs. Should it say 1/2 of the mixture on each breast? Hi Frank, I used 2 chicken breasts, each one cut in half giving me 4 servings. So 1/4 of the mixture went on each of the 4 pieces. I hope this helps! If 1/2 breast is too big a serving, you can actually cut one breast in 3 pieces and make 6 total servings. These are small and good for a small appetite but not for most men! Thanks. Feeling kind of dumb. Must have been reading without my brain engaged. There are four equal sized pieces of chicken. Thanks Elaine, that is correct – 4 equal size pieces. You can also go with cutting each piece into thirds but the servings are pretty small. Thanks! Hi Lauri, you are so right. jalapenos for the spicy spirit would be great. I have had others ask about grilling and although I haven’t done it, I can totally see how it will work fine. Thanks for sharing! Made this last night for a friends and my birthday dinner was very good. I added broccoli and Mexican cheese instead of pepper jack cheese to the cream cheese. We had stuffed mushrooms, roasted potatoes and corn on the cob. Rave reviews from everyone. Defiantly will make again. Kenda, Thank you so much for sharing your side dishes. I love to hear how others use the recipe and especially what you serve alongside. Thank you! I’m thinking a few jalapeño pieces in each breast would be a nice addition if pepper jack was not available. Think I’ll try it soon! Sheri, you are right and next time I am going to do that! Going to try this within the next few days, but being a true New Mexican, gonna have to add chopped green chili to the stuffing mix. Neil, wonderful recipe to make your own! Thanks for sharing, let me know how it turns out. Nell, I am a New Mexican too. As I have been reading all of the ideas, I too have been thinking “NM green chile”! Made this last night…absolutely delicious! Looks impressive, too. Sandy, thank you for letting me know. So glad you like it! This sounds awesome but I would like to know the carb. count on this recipe. I don’t know .. but I will see if I can figure it out. Do you slice the chicken like you butterfly a steak and then pound it to make it a 1/4 inch thick? What do use to pound it? Looks scrumptious! Darlene, I just cut a chicken breast in 2 or 3 pieces and pound with a meat mallet. Yes, about 1/4″ thick is great or a little thicker is okay. I recently use the base of a water glass because I was visiting friends and we didn’t have a meat mallet! Enjoy! This looks delish! What would you serve with this? Mashed potatoes and green beans are always perfect with chicken. However, I have done this with a rice medley and a broccoli and cheese casserole. You will find these are tasty and look so nice on the plate that many things can accompany. Thanks for stopping by my blog! What if I don’t have cream cheese (or any of the reasonable cottage cheese/yogurt) substitutes? I have some good block cheeses (buffalo wing cheddar and smokehouse onion cheddar), but my cream cheese just went bad. I wanted to cook this tonight and not have to run out to the store. Has anyone tried this *without* the cream cheese? Holly, I am late responding, but I believe you can substitute the cream cheese, even using shredded cheese (cheddar or the like) adding a little bit of mayo to hold it together as stuffing. What did you end up doing? I would love to know! I ended up just getting the cream cheese, but I will definitely keep this in mind for the future, in case I get into a jam again. It was delicious! Bought everything going to try it tonight. Thanks I have a granddaughter that loves bacon and mainly only eats chicken for dinner. Great to make them together for her. Susan, how did your chicken turn out? They’re in the oven now! I’m a mom to two small children, so I don’t always have a lot of time to fuss over a recipe, and I was surprised how quickly these came together. It’ll be even faster the next time I make them. I’m hoping my finicky little ones will like the recipe. Thanks for sharing such an easy, fun recipe. This recipe was a HIT in my household. The only thing I did different is cut up some bacon pieces and added cheddar cheese because my oldest DON’T DO SPICY AT AL. My husband was born a Chef and can cook anything. So of course I was a little afraid to try this but he love it. He cut his into two pieces and added soy sauce. The girls just loved it by itself. Thank you Catherine we will be bringing this one back to my oven or grill soon. how do i get the recipe! Can this be done on the grill?? This recipe is in Dana Carpender’s cook book “500 Low Carb Recipes” and I have been making it for years. In that version you do it on the grill after wrapping it in bacon until you see no chicken. When the cheese starts to ooze out, it’s done! And it’s delicious! Liz, thank you so much for this information! I am going to check out the recipe in Dana’s book! I got it from Facebook with no credit to the author. I would love to update the recipe with credit to the author! Also the carb count would be good to know. Thanks! I am going to try on the grill this summer also! I think it will be great. I’m cooking for a first date I’m a male do you think this is a good meal to wow her? Steve, if she likes bacon — definitely YES! It is also really easy to do, just takes a little time and several steps. You can make it the day before, wrap it tight and pop in the oven when ready to bake. Also, one reader says to baste with chili sauce. That sounds wonderful too! Good luck and blessings. Jackie, please tell us how they turned out. Do you have a picture? Yum! I knew the recipe had to have been around awhile … the whole bacon thing just really gets our attention, doesn’t it? I made these this week and they were delicious! I unfortunately tend to overcook chicken, so i am always a bit nervous about new dishes, but these were cooked perfectly and very tender. One question–can they be put together before hand, frozen, and then cooked later? Any pointers? April, for years I cooked my chicken to death. No offense to my sous-chef dish-washing mom, but some where along the line she told me “chicken takes an hour to cook.” That was my mantra for years. I know now it doesn’t always take an hour to cook! Yes, these can be frozen and cooked later. Start with fresh chicken, because I wouldn’t freeze chicken that had previously been frozen. Make the whole piece including wrapping in bacon. Seal them up well, (plastic then foil) or better yet, freeze on a tray for an hour or two and then place in seal-a-meal bag and close airtight. Then bake them right from the freezer. They will take longer to bake, just use an instant read thermometer — at least 165 degrees. You can also make day before, cover well in refrig and then bake just before serving dinner. I have done this for a dinner party, works great! Janet, Monterey Jack (sometimes shortened simply to Jack cheese) is an American semihard cheese, customarily pale yellow or white, made using cow’s milk. It is commonly sold by itself, or mixed with Colby to make a marbled cheese known as Colby-Jack (or Co-Jack). Cheddar-Jack varieties are also available. Pepperjack is Monterey Jack with jalapeno peppers mixed in. If you can’t find pepperjack then other variations may include a blue cheese or Havarti or Havarti dill. Really any of your favorite cheese that you can mix with cream cheese will work! Pepper Jack Cheese is Monteray Jack with jalapenos in it. I didn’t use that. I used Monteray Jack and canned green chilies. It was delish! Thank you Linda, so glad it was a success. Linda, good idea on the canned green chilies. Any type of favorite flavoring will work. I recently did these mixing in cooked crumbled bacon and red chili sauce. Oh they were so good. So many options! Have a great weekend. I don’t usually like to fuss too much with chicken but this looks so good I can’t wait to make it! Thank you for sharing! Judy, I don’t think you will be disappointed. Let me know how you like it! Yes Penny, it is as good as it looks! Sooooooooooo seriously nummy ! Nothing like sweet and savory !!! Ha! Ha! Zan. I hadn’t heard that saying! Reminds me of the cajun seasoning that I just love …. “Slap Ya Mama”. I’ll bet these are as pretty as they are delicious. Great ideas! I have a problem with peppers but think a horseradish jack (mild flavor) or green pesto gouda would substitute nicely! Hi Rochelle, you are so right! Both the horseradish jack or pesto gouda would be fabulous! So many options … thanks for stopping by, hope you will visit again! I make this for my husband at least once a month. But for my filling i fry up bacon and poor the cooked bacon and a little grease in to the cream cheese and mix it together. Plus i wrap the chicken in bacon. U can never have enough bacon. Wow Whitney — that sounds fantastic! I have some bacon I want to get used up … hum? Thanks for sharing! Just a FYI — They now make BACON FLAVORED cream cheese, among other wonderful flavors — no need to add anything extra unless you want to! YUM!!! Paula, I haven’t seen the bacon cream cheese yet but wow that would really make this pop! Thank you! Oh Audrey, you are so right, I can just imagine a nice, slightly gooey warm mozzarella. Thanks for sharing! Oh Audrey, you are so right. A nice slightly warm and gooey mozzarella sounds perfect also! Good morning Marilyn, Thanks for your comment. Sweet Chili sauce sounds wonderful with this! I am going to try soon. Thank you! Have a blessed day. I think the sweet chili sauce is an awesome idea with that bacon. Just when I thought it couldn’t get better … it did. I am making these this weekend! Thank you everyone! I think you will really enjoy this! After all the recent activity around this recipe I am going to make it again! Blessings! I just bought all ingredients. Wish me luck! Good to know! I can imagine this with a nice stuffed chop! This was a gold metal recipe years ago in women’s day magazine . They use cream cheese w/chives. Also it called for baking on the top oven rack @ 425. The bacon becomes crisp & u don’t need to use the broiler I hated pounding the chicken. So I use a split chicken breast, bone in, make a pocket in the middle & stuff. Then wrap with bacon. Much easier! Hi Jane, thank you so much for the additional information! Love it! All I can say is I wish it was dinnertime right now (and it’s not even 10:00 a.m.). These sound heavenly! Sounds terrific Lynn! I’ll give it a try!